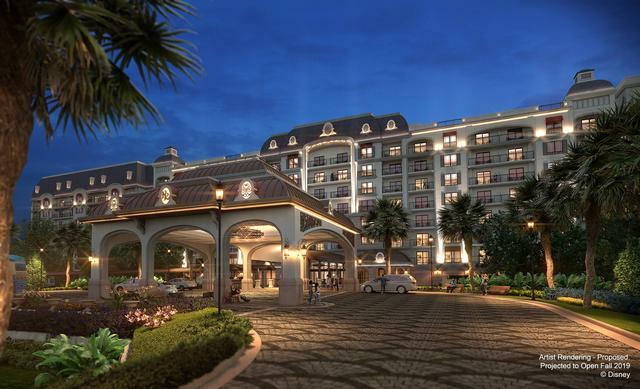 January 22, 2019, 4:05 PM · Walt Disney World is now taking reservations for its newest hotel — Disney's Riviera Resort. Disney's 15th Disney Vacation Club property will open this December. The European-inspired property will feature approximately 300 guest rooms, including deluxe studios, one- and two-bedroom villas, and grand villas that sleep up to 12 people each. "Disney's Riviera Resort is inspired by Walt and Lillian Disney's travels throughout Europe and the Mediterranean coastline — from France to Italy," Terri Schultz, senior vice president and general manager of Disney Vacation Club, said. "Walt fell in love with European art, architecture, food and stories, and his extended tours of the region continue to influence Disney storytelling and theming." The resort also will feature a new room category for Disney World — tower studios. 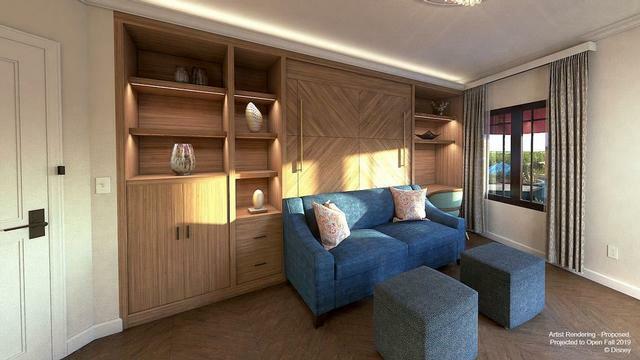 These rooms will sleep two people each and include a private balcony with seating for two. "Built into the wall, you'll find a kitchenette, drawers and a cleverly hidden pull-down queen-size bed that just as easily tucks away to reveal a comfortable lounge-worthy space," Disney's description said. The tower studios start at $335 a night, plus tax. Deluxe studios start at $503 a night, and one-bedroom villas start at $743. Two-bedroom villas start at $1,136 a night, while the three-bedroom grand villas — with one King bed and four Queen beds and 1 Queen-Size sleeper sofa — start at $2,277. DVC sales and member bookings using points will begin at a later date. 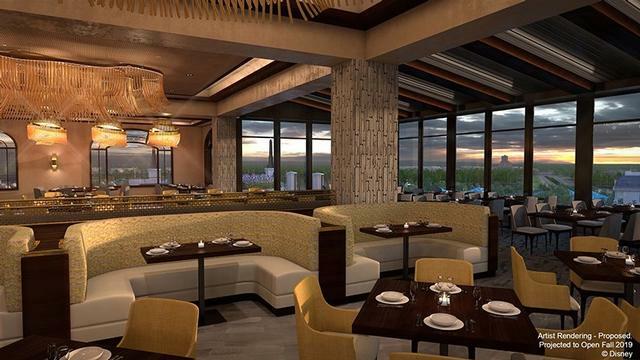 Restaurants will include the rooftop Topolino's Terrace – Flavors of the Riviera, featuring the Italian name for Mickey Mouse. Topolino's Terrace will offer signature table service at dinner and a character meal at breakfast. Disney's Riviera Resort will be one of the hotels served by the new Disney Skyliner gondola system, with direct routes to Epcot and Disney's Caribbean Beach Resort, from where you can continue to Disney's Hollywood Studios. The exterior looks nice, but the inside looks a bit humdrum. That rooftop restaurant looks amazing! I can't blame Disney for milking DVC for every penny, but for those of us that hold strong disdain for the timeshare arm of the company, this resort is more of the same - overpriced to meet the needs of the average guest visiting WDW. Also, let's not oversell the access to the Sweatliner, since the closest gondola station is located at the adjacent Caribbean Beach resort, not actually at the Riviera. Who knows how long the walk will be to reach the hub station, and how much guests will already be sweating before they get stuffed into stifling plastic boxes. I also find it funny that Disney is trying to market this resort as aligning with Walt's personal preferences for European travel. Walt's been dead for over 52 years, and travel and accommodations have changed a lot over that time. He may have liked the concept of a Murphy Bed in the early '60's, but that doesn't mean it's a good choice for sleeping arrangements in a modern hotel where designers have unlimited resources and virtually unlimited space. The constant appeal to guests through Walt-nostalgia is getting smarmy. RM doesn't know what he is talking about. There is the Trinidad gondola station at the Carribean Resort and a DVC station located about 50 yards from the new Riviera Resort. You're right TH. I stand corrected and thank you for the clarification. I went back and looked at some of the updated designs for the Sweatliner, and it looks like what was going to just be an aerial pivot point in the initial announcement was modified to include a pivot station at the Riviera Resort. Caribbean Beach will still be a "hub" station, with lines from the resort to DHS, AoA/Pop, and EPCOT (with a pivot stop at Riviera). What is unclear though is whether guests riding from CB to EPCOT will be forced to get off at Riviera or if they can ride through the pivot station. If they can just ride through to EPCOT, the question would then be, what will the lines be like for guests at the Riviera who are waiting for an empty gondola so they can get to EPCOT during peak ride times. Will operators have to send empty gondolas from CB to make sure there's available capacity for guests at the Riviera, or will there be a way for them to turn empty gondolas coming back from EPCOT at the Riviera Station (and vice versa).